Here is my cover of 'Part Of Your World' from The Little Mermaid. Hope you enjoy! Today I felt rather creative and decided to make my own chocolate covered strawberries. The alcohol part is optional. This is a really simple DIY project and you can't go wrong. Step 1: Cover your tray with tin foil/baking paper. Step 2: Wash and dry your strawberries. Step 3: If you would like alcohol inside your strawberry, take a toothpick and poke a few holes around the strawberry near the bottom. Else, skip this step and move onto step 5! Step 4: Pour the alcohol of your choice into a small bowl. Take a toothpick and poke a hole into the top of the strawberry. Soak it into alcohol for a little while, rotating as necessary. Step 5: Pour chocolate chips into a (microwaveable) bowl. Heat the chocolate in a pan or if you wish to make life easier for yourself, heat it for 30 seconds on low heat setting in your microwave. Step 6: Wrap a cloth around the bowl and remove from microwave. Step 7: Stir the chocolate until melted and smooth. If you can still see chocolate chips, place back into your microwave for another 30 seconds. Repeat step 7 until chocolate is smooth. Step 8: This is the fun part! Hold your strawberry by the stem and dip half of it into the bowl containing chocolate. Repeat for all strawberries. Step 9: Place your chocolate covered strawberry onto your baking tray to set for 10 minutes. Step 10: Place the tray into your fridge for an hour. As Christmas is just around the corner, these would make great little gifts for your family and friends or a nice treat for yourself! It has taken me so long to find a white blouse and I have finally found one! River Island's Dolly Blouse for £22. It's long sleeved, fitted, has a black bow and is simple enough to mix and match. Perfect. Made my week. My favourite make up item - lipgloss. I guarantee you will find more than one lipgloss in my make up bag. I probably have more lipgloss in my make up bag than pens (decided I no longer need a pencil case, saves space = saves me from carrying a heavy bag). The Shiseido and Kanebo lipgloss are a gift from my best friend. First impressions of the Shiseido and Kanebo lipgloss: Smells good, sheer colour, moisturising and very sticky. Almost like Lancome's Juicy Tubes. I wasn't too keen on how sticky they were at first but after a while I got used to the texture. The glitter on the Kanebo lipgloss are more visible than the Shiseido lipgloss. I've been using the Shiseido lipgloss every single day before I leave my house and it lasts for several hours before I reapply my mac lipgloss that I carry around with me. The Lancome lipgloss is great for dry chapped lips, definitely handy for colder months. As always, I will apply Vaseline, then lipgloss on top as I find it gives the best effect. Here is my "how to" guide for surviving rush hour on the London Underground. 1. The most obvious one: don't travel during peak hours (06:30 - 9:30 and 16:00 - 19:00) unless you absolutely have to. Ironic how we pay more to travel during peak hours when I'm paying to stand in a crowded corner of the tube carriage. 2. Plan. Make sure you know your journey route and plan an alternate route just in case. 3. Get there on the platform earlier than you would...because it's quite likely you won't be able to squeeze onto the first train if you're changing lines during peak times. 5. Listen to music - shut your eyes and imagine you have lots of space around you. 6. Wear your most comfortable heeled shoes - this will increase your height giving you more space to breathe if you are unfortunate enough to stand for the whole of your journey. 7. Keep an eye on your belongings. Make sure your bags are zipped and possessions out of sight from pickpockets. 8. Escalators - stand on the right, walk on the left. 9. Know which side of the doors open for your station and stand on the correct side. This will save you from squeezing past 10249348 people. 10. Know which carriage to get on - by this, I mean knowing which carriage doors open to give you the exit passage at your destination station. Those are a few of my personal tips, have you got any to share? What are your experiences on the London Underground? A cover of Taylor Swift's new song 'I Knew You Were Trouble'. Enjoy! Here's my new YouTube video, a guitar cover of Taylor Swift's new song - Begin Again. And to all my Chinese readers, Happy Mid - Autumn Festival! 中秋節快樂! This beautiful lipstick by Dior (Rouge Dior 451 Cinderella) is the latest addition to my lipstick collection. The price is £25 from Boots. This is my first ever Dior lipstick - I normally use mac/Lancome lipsticks or just lipgloss. I had difficulty picking out this lipstick, especially when there are millions of other pretty shades. That's the thing about buying lipstick, there's too much choice. I was waiting to be served at the Chanel counter but they were busy so I got side tracked in the Dior counter instead. Oops! Moving along, the packaging is what initially drew me to the product. It's well designed and the case looks sturdy. It isn't something I would pack in my daily make up bag though, it would take up too much space. The colour is a pink coral with gold shimmer! Before I apply this lipstick, I use vaseline to give it a good base and to help the lipstick last longer. When applied, it looks natural and not too over the top, it's great for an every day lipstick. Forever 21 - Socks for autumn/winter! Sorry for no blog updates in a while! Been a hectic few weeks...but I'm back and ready to blog. My friend and I decided to have a browse in Forever 21 on Oxford Street. First thing I noticed when I walked into the store: Woah - has Forever 21 expanded?! I believe it has. It is a lot wider than I last remembered. If I remember correctly, Desigual used to be next to Forever 21? I walked into the store with a mission though, so up to second floor we went. I was looking for autumn/winter socks which I can push down and peek out from my autumn/winter boots. I am not so much a fan of autumn/winter, I catch too many colds in autumn and winter. Normally, I like to wear tights in autumn/winter and pair them with shorts or a skirt (rare). I'm not so much of a jeans person anymore - shorts are so much comfier! Who agrees? I picked 2 pairs, one blue pair which are knee highs and a maroon/oxblood (the IN colour this season) over the knee pair of socks. They feel soft but I have yet to wear them out, I will save them for the colder months. They costed £3.90 each, which I think is reasonably priced, totalling to £7.80. At the counter when I was about to pay, I was asked whether I have a student card - yes, I do. This is one thing I love about being a student. Student discount. Forever 21 now offer a 10% discount to all students - more reasons to shop there! Recently, MUA (Make Up Academy) had a 25% off all products on their website for reaching 25k likes on their Facebook page. Once they reach 30,000 likes on Facebook, their next offer to all customers will be 3 free products from the Love Hearts Collection. For this purchase, a minimum spend of £10 was required to qualify for the 25% off and free shipping, so I spent £7.50 in total and bought 2 eyeshadow palettes and 2 single eyeshadows. In the second photo, the top palette is called Undressed (drugstore dupe of Urban Decay's Naked palette) and the bottom palette is called Starry Night. These products are from the Make Up Academy Professional line. The single eyeshadows (shade 4 pink & 9 purple) are from the Make Up Academy line. I have, in the past, purchased an E.L.F eyeshadow palette but it did not compare to the quality of this palette. I found with the E.L.F palette, it wasn't pigmented enough and there were usually fall outs from the eyeshadows. On the other hand, both my MUA palettes are highly pigmented and there are not as many fall outs as from the E.L.F palette. Obviously, for the price you are paying (£4 normally), the quality is not going to be the exact same as a premium eyeshadow brand such as Dior or Lancome. The packaging of the 12 eyeshadow palettes are sturdy and the lid closes well. The eyeshadows do not have names but they are given numbers on the back of the palette. Included is also a double ended eyeshadow applicator brush which is really stiff and not soft like regular eyeshadow applicators. I'd recommend you to use your own brushes instead! I think I would prefer to have a mirror inside the palette as opposed to an eyeshadow brush which I will not use. Moving onto the Undressed palette, it is clearly a dupe of Urban Decay's Naked palette (Even the colours are aligned in the same order as they are in the Naked palette hint hint haha). The colours are extremely similar. I was thinking of buying a Naked 1 or 2 palette but the cost £36 drew me back and also, as someone who already owns a lot of eyeshadows, another palette is just not necessary. Price is a huge factor and for MUA to create a 12 eyeshadow palette for £4 (purchased for £3 using 25% code)...I knew I had to try it out! The single eyeshadows do not seem to have a smell but the palettes do seem to have a slight drugstore eyeshadow smell. It is not something I would use every day but it isn't something I'd neglect and leave untouched. The colours in the palette are definitely wearable! Overall, I'm very satisfied with my purchase and at £4 for a palette containing 12 eyeshadows, you just can't go wrong! I'd recommend you to check MUA out if you haven't already! 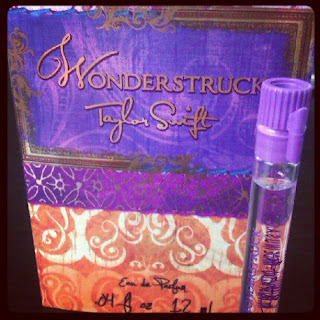 My Taylor Swift Wonderstruck perfume sample arrived today! I got it through the Facebook Taylor Swift Wonderstruck application. I requested a sample so long ago through the application that I almost forgot about it! My sister actually bought the full sized bottle yesterday (£20 for 30ml from Boots) being the huge and crazy Taylor Swift fan she is. She has hidden it somewhere though, probably to stop me from using it - like she does with my perfumes. The name of the perfume 'Wonderstruck' is from one of Taylor's songs 'Enchanted' where in the lyrics she is 'wonderstruck, blushing all the way home'. The song describes the feeling when you first meet someone you really like who makes you feel 'Enchanted' in a magical sort of way. I do like the colour combination of the packaging. It's pretty, purple and romantic looking. First thoughts about the perfume: It smells so much like Britney Spears - Fantasy. 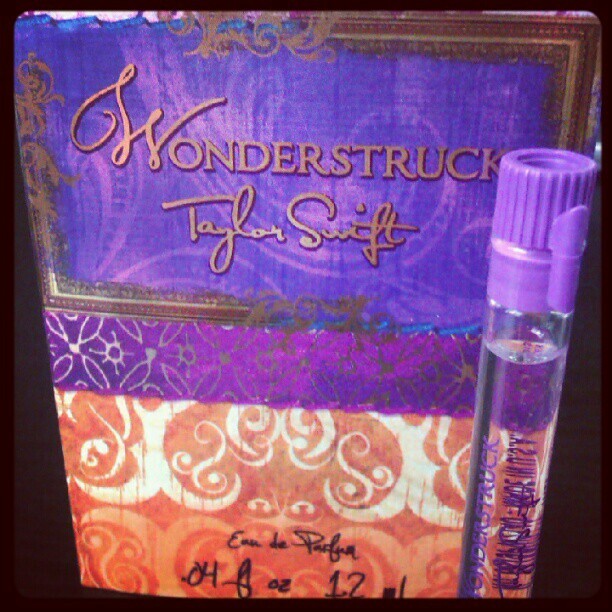 If I were to describe how Wonderstruck smells like, I would say it smells like Fantasy! I did like Fantasy, especially the bottle design with crystals around it, but I found too many people wore it. Clearly though, it's a popular choice for a fragrance scent. I predict Wonderstruck will be the same, a scent for teenage girls who adore Taylor Swift. Launched in collaboration with cosmetics company, Elizabeth Arden (much like Britney Spears - Fantasy! ), the fragrance composes of floral, fruity and sweet notes. The bottle design is beautiful with cute charms hanging around it. I've had this perfume on for 2 hours approximately (scent has almost disappeared so it doesn't last very long) and it definitely smells like Fantasy. Definitely suitable as a day perfume! I believe I have mentioned how it smells like Fantasy a million times in this post but the point I'm trying to get across is that...it smells like Fantasy. I would recommend it if you are a fan of Taylor Swift and prefer sweet and feminine perfumes. This is Maybelline's Colour Sensational Lipstick in shade 530 - Fatal Red. There's a reason why I purchased this, you will soon see why. I'm a huge fan of Maybelline's Coral Drama eyeshadow palette which are neutral - bronze shimmery colours so I decided to try out their lipsticks too. My thoughts on this lipstick? I didn't like the smell much...the shade is perfect though if you're looking for a bright and bold red colour. It does feel heavy on though which I'm not too fond of either. It's very pigmented and has some sparkle. I wouldn't repurchase though simply because of the fragrance on this lipstick. Sorry Maybelline...forever a mac and Lancome lipstick fan. As I was flicking through the pages of InStyle magazine, I noticed the advert for Max Factor's Flipstick. The model was wearing shade Gipsy Red and that's when I decided to go and buy one for myself. It looked really interesting, the whole lip was in the red shade but in the centre of the lips was a gold shimmer. Price is £8.49 from Boots and there is also a 3-for-2 offer currently. I didn't buy anything else as there was nothing else I really needed. I think price wise, it is incredibly pricy for a drugstore product. The packaging is not fancy at all. I have never owned any Max Factor products before so I guess you can say I was slightly disappointed in terms of the packaging aspect. Moving on to the product, it is double ended so you are paying for two colours instead of one. To get the colour, you twist the lipstick up. The lipstick bullets are quite thin so you must be gentle with application. One flaw I've found with this lipstick is that it sits in the cracks of your lips quite obviously, so make sure you have a thin layer of lip balm (my personal choice is Vaseline) before applying the red/orange colour. I loved the colour though, it's quite bold but a pretty shade. The red colour is highly pigmented and one swipe on your lips are enough. However, the gold colour isn't heavy enough so you do need to apply a few more coats before colour shows over the red. Both the colours have specks of glitter and are sheer. Compared to other high street drugstore make up brands I've bought lipsticks from (17, Rimmel, Maybelline, Revlon) I can tell you that Max Factor wins for lip scent. It has a pleasant, light scent. 17 is unscented whereas Rimmel and Maybelline smell the same, sort of like plastic cherries (is it just me?!) which I'm not particularly fond of. Lasting power of this lipstick is long, lasts for 4+ hours if you don't drink or eat anything. Overall, I'm quite satisfied with the product. If this colour combination didn't exist, I wouldn't have purchased this product as I think you can achieve the same look with lipsticks you already own! Do you own one? Don't know if those who read my blog know I have a YouTube channel...if you are interested you can watch my videos here. This is my cover of Demi Lovato's new single 'Give Your Heart A Break'. The music video was shot in Portugal over the span of 2 - 3 days. I had a lot of fun being in it and I'd like to thank my film crew, consisting of one member (so I guess it's not really a crew), for being so patient, directing and filming all of it for me. The editing is done by me on i-movie. For a first music video cover, I'm really happy with the outcome of it. It's a shame we don't have fancy filming equipment to make the footage more steady (stabilizing on i-movie only does so much) but hopefully next time I'll be able to use my mini tripod and place it on a table. Anybody want to guess what my next music video cover is going to be? Finally I own a pair of lace shorts! The best bit is that I bought these on sale from Zara, TRF collection. Original price: £22.99 Sale price: £17.99 These are really girly and comfortable. It has a zip on the side and it has elastic around the waistline. The first time I wore them, I paired it with some black tights and light sweater with a chunky knit long cardigan from Mango to balance out the shorts. I am a little disappointed though as the material kept scraping against the knit cardigan, damaging the ends of the shorts. They aren't fully black anymore as it has bits of pink/white (from my cardigan) which kind of destroyed these shorts. Oh well...I'm just glad I didn't pay full price for them. This is the first time I've tried a Chanel lipstick. Once at the Chanel make up counter, I asked one of the make up artists to match me up with a red lipstick. She asked whether I've ever worn red lipstick before so I told her I never have. The shade she picked for me was Monte Carlo (shade number 62) from the Rouge Coco Shine line as I told her I prefer a glossy look as opposed to matte finish. I like this Chanel lipstick, think I would rate it the same level as Lancome lipsticks. The colour lasts long and it doesn't feel dry or heavy on my lips. It is non-scented. This is what it looks like on. It's not red red, but it's red enough compared to my other lipsticks. The price for this lipstick is £24. I would recommend this to you if you are looking for a long lasting lipstick and prefer sheer finishes! The tube is small, great for travelling with and also very pretty. These lipsticks are not scented which is one thing I like about them - another thing I like are how wearable these shades are. These are great every day pink shades. Rose Candy is a Barbie pink colour whereas Soft Marshmallow is a cool toned pastel pink colour. The texture of these lipsticks are sheer which is great as it gives a bit of shimmer and shine whilst keeping lips moisturised. I do find I have to reapply every few hours but that's ok. Top it off with a coat of lipgloss to make the colour stay longer and you should be good! Estée Lauder's Double Wear Stay-In-Place concealer is my favourite concealer. It costs £20 for 7ml. Although it is expensive, I do find this concealer lasts for a very long time. The liquid concealer comes with a wand for easy application. My shade is 02 light medium and I always go back to this concealer. It does what a concealer is meant to do - conceal blemishes. A little dab is all you need, use sparingly and blend out with a small brush or clean fingertips. It gives very good coverage and is really long lasting. This concealer is very natural looking and does not give a cakey feel. I do find, however, if you use it under your eyes, it may set into fine lines so I tend not to use it there. If you are looking for a long lasting concealer from a premium cosmetics line, I'd definitely recommend you to give this a try. Packaging Are you bored of your hair? Read on and I'll tell you how to get people talking about your hair...guaranteed! I was watching these hair tutorials on YouTube and came across one called the Waterfall braid. 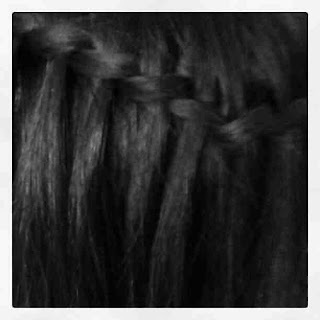 It's a French plait embedded in your hair with a waterfall effect. I'm not very good at hair styles so I asked my sister to watch it and try it on my hair. 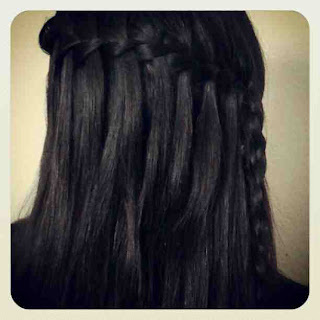 You can learn how to achieve this look here (Waterfall twist) and here (Waterfall French braid). The Waterfall twist is easier as you only take 2 pieces of hair whereas the Waterfall French braid requires 3 pieces of hair. What I didn't expect were the amount of compliments I would receive with it. I even got stopped by a lady whilst walking home telling me she admired my hair style and asked how she could do this. So just before I end this post, I'd like to thank everyone who has complimented my hair style in the past month and a huge thank you to my sister who helped plait my hair at 7am in the morning. Having seen this product advertised everywhere, from magazines to posters on buses, I thought it would be time to buy one for myself and see what all the hype is about. Yves Saint Laurent's Touche Eclat is a highligher pen. It's pricey - costing £25 but it is from a premium cosmetics brand so I hope the product justifies the cost. Packaging is simple but effective. It's gold and shiny which adds to the high end feel of the product. The applicator brush on the pen is soft and flat, allowing you to evenly apply the product. The pen has a clicky top to press for the product. At the Yves Saint Laurent counter, I asked the make up artist to help match me up with a shade, since I do not trust myself to find my own shade (Don't exactly want to walk out of my house with two different skin tones!). He looked at my skin colour and immediately told me I'm a shade 2.5. Impressive. I tried the 2.5 shade under my eyes in the store lighting and it was indeed a perfect match. The product glided on smoothly and did not feel cakey. It did cover up dark shadows and made me look more wide awake. You can use this pen anywhere on your face where you have dark shadows, under the eyes, sides of your nose and to brighten up dull areas. What I like about this product is that it's travel friendly, you can easily put this into your make up bag and touch up when needed. On the down side, you can't see how much of the product is left in the pen and the tip of the pen would require cleaning. Would I use this product daily? Probably not. I would only use this product if I've stayed up super late and need that something extra to cover up dark circles. (Concealer normally does the trick anyway.) Benefit also has a product, of which some may be familiar with, called Eye Bright - It's a chunky pink/peach toned pencil which does the same job. Only difference is that Benefit's Eye Bright has a slight shimmer in the pencil. I like to apply Eye Bright to the inner corners of my eyes which helps to brighten them also. So ladies, don't worry if you didn't get enough sleep last night, invest in YSL's luxurious Touche Eclat pen and it will conceal those dark shadows and enhance your natural features too! This is one of my recent Lancôme purchases! This mascara pack contains 2 Hypnôse Doll Eyes Mascara in black which retails for £30. The mascara wand has a decorative rose design which adds a nice touch to the packaging. The wand in the last picture is cone shaped, thinner towards the front and thicker towards the back. I think the original Lancôme Hypnôse mascara gives a more dramatic look compared with the Hypnôse doll eyes mascara. Doll eyes formula is quite thin but it does give you the chance to control and build up the layers as necessary. Compared with other mascaras I have used, this one is really good and is level with Benefit's Bad Gal Lash which is my all time favourite. I tend to go for more natural looks when it comes to eyelashes so my routine is to curl lashes and to add a coat of mascara. If you are after an every day mascara which is not too dramatic, this is the one for you. It lengthens your lashes as well as provides volume without clumping. It really does give you a natural doll eyes effect. The make up bag is shaped uniquely with a curved zip design to hold everything inside together. The rose designs are printed on both sides of the make up bag, there is a shiny jewel attached to the strap, very chic and elegant. This is definitely one of my favourite make up gifts! If I remember correctly, last year Lancôme did something similar, offering free Lancôme products with the purchase of 2 Lancôme items but it didn't include a make up bag. The lipstick is a shimmery light red/pink colour, a very wearable every day shade. Lancôme's Génifique is a serum, suitable for all skin types, to help your skin look radiant and glowing! I love using this product before I apply cream on my face. If you have dry skin, it helps to hydrate it, the serum is light and absorbs quickly. Eau Micellaire Douceur make up remover is gentle and fragrance free. Lancôme's Hypnôse volume mascara really does volumise your lashes. Visionnaire is also a serum to keep your skin looking youthful and wrinkle free! There's something for everyone in this gift set - a great way to try different Lancôme products without breaking the bank! When you want to sleep, you can't and when you have to wake up, you want to sleep. Who else is the same? Waking up, for me, is actually really easy. It's getting out of bed which is the trickiest part. Let's start with waking up and I'll let you know my tips and tricks on how to always wake up on time. 1. Set 3 alarms. Not 1, not 2 but 3 - I use my phone as my alarm clock. The first alarm is there to wake you up on time. The second alarm makes sure you wake up again once you've turned the first alarm off half asleep and go for your 5 minute "snooze". The third alarm is your final call. Hopefully, after two alarms, you will already be out of your dream/half asleep state and be awake. 2. Use a LOUD alarm ringtone and set your phone to vibrate mode. My alarm is the Overture from The Phantom of The Opera. I believe after you've heard it if you are not already familiar with it, you will understand why waking up is really easy for me. Also when your bed is vibrating, you can't really go back to sleep properly. 3. Put your alarm clock on the other side of the room. This forces you to wake up and get out of bed. If you know me really well, you will know that I love to shop online. In fact, asos is probably the place I shop at the most if I think about it for both offline and online. You must be thinking why? For starters, shopping is time-consuming. It takes time for me to travel to and from my shopping destination whereas for online shopping, I can sit in my pyjamas at 3:05am, log onto asos and buy a dress (For those wondering whether I really have done this...yes, I have.) This way, I also avoid the crowds in shops and there's no need to wait 2392304 minutes in a long queue. Shops can often be messy too, making it hard to find what you are after but not for online shopping - there is a search bar, meaning I can find what I'm looking for almost instantly. It stops me from endless browsing and helps me buy things I actually need, not want. Another reason why? asos has so many different brands, it's like shopping at a virtual department store and I don't have to walk to get to the next shop. Online shopping has made my life so much easier. Now you know why! My first ever mac lipstick was bought for me by my best friend as a Christmas gift. My wonderful friends also bought me two mac lipsticks for my birthday last month as part of my present (Thank you so much, I love the shades you picked!) They picked Speed Dial which is a cremesheen finish and Politely Pink which is a lustre finish and probably my favourite from the ones I've tried. Mac lipsticks smell so good - like vanilla! Speed Dial is a fairly bright pink colour with some gold shimmer. It's a wearable every day look colour and you can build upon the colour to increase the tone of pink. Politely Pink is a frosted pale pink colour, perfect for a natural day time look! The lipsticks are pigmented and I always apply some Vaseline to my lips before applying my lipsticks. I think both shades work well with my NC35 skin tone. I also like to add a coat of lipgloss (usually this one) over my mac lipsticks to give a bit more shine. They retail at £13.50 and compared to other high end cosmetic brands are a good price in my opinion. I used to be more of a gloss girl than a lipstick girl but I think I am gradually moving over to the lipstick phase. Of course, I am still a loyal lipgloss fan as it keeps my lips moisturised throughout the day! Have you got a favourite mac shade? Tell me below!